If you’re like many bloggers out there, you’re looking to make it big and create a worldwide brand that people love. Maintaining a blog is a ton of work, but you can’t forget to communicate with your audience to keep them engaged. Considering that email marketing conversions statistically beat both search and social media marketing combined, it’s no wonder that more bloggers are turning to email as the primary way they communicate with their audience. We want to dig in and see what kind of emails bloggers are using to bring in more subscribers and build trust. There are certainly lessons to be learned from successful blog owners on the web. The welcome email is one of the most simple, yet underused tactics in email marketing. If someone signs up for your email list, it pays to send them a simple welcome email thanking them for taking the time to sign up. In fact, 76 percent of people expect to see an email welcoming them after signing up as a subscriber. This is also a great opportunity to give them additional information about your brand or how they can access their content for signing up. 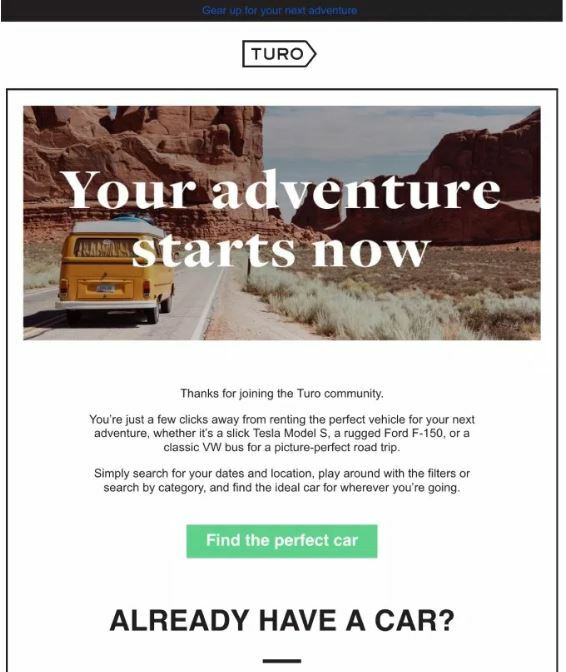 Below is an example of a great welcome email from Turo, a service that allows people to rent their cars or find a vehicle to rent. There are a few important standouts in this email. First, and at the top of the page, is a colorful image that is meant to inspire the customer by encouraging them to start their next big adventure now. Another excellent move on the part of this company was to start the email with the word “Thanks.” Why? It turns out that “thanks” and “thank you” are some of the most important words to subscribers when they sign up for an email list. Terms like this are designed to give human qualities to your business, which promotes rapport between your business and customers. Below the “Thank you” section there are two clear CTAs for both types of people that may want to sign up for this program. The first CTA is “find the perfect car” for renters, and “List your car,” for people who would like to rent their cars out. The welcome email is absolutely vital to any marketing campaign. There’s more data to back up this claim. OptinMonster reports that app creators who use a welcome email as part of their process for new customers see a retention rate of 71 percent. When we start doing business with a new company, we like to have expectations. Your customers are going to expect the same from your brand too! It turns out that not providing the customer with expectations, and by default a wonderful experience, it is likely costing you a ton of money. One survey revealed that 86 percent of people are willing to pay more for a product if they get a great experience in the process. You can improve the chances that they have a good experience on your blog and continue shopping with you by setting some expectations as soon customers start subscribing. 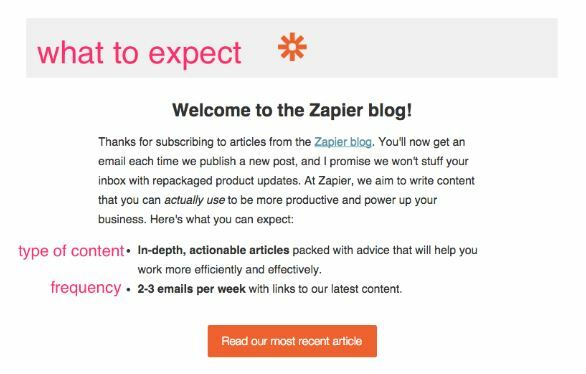 The following example of a website called Zapier Blog managed to combine their welcome email and expectation email together. Let’s take a look. As you can see, this is a simple and effective email that lays down exactly what new subscribers can expect when they sign up. They will receive great content, and only 2-3 emails a week. At the bottom, there is a CTA that cleverly matches their logo color at the top of the screen. The CTA is common of a blogger, as they want eyes on their content. Bloggers want people to click through and see their latest posts so they can get excited about future email engagement. You can probably see where this is going. Any blogger worth their weight will have something for free that they can offer their customers. If they don’t, there’s always the opportunity to create a freebie from scratch. Virtually anything with an existing value given away for free as an increased perceived value. This is where your marketing skills kick in. There are plenty of things you can give away as a blogger to your subscribers. Some of the most common trends are to create a unique listicle style articles in your niche, offer your latest podcast transcribed, a free trial, or even create a ‘top secret” checklist everyone interested in your niche needs. Make your call to action in this email to hit reply and email you with the answers to questions such as hurdles, general questions, or tips they would like to hear more about in your consultation. When the emails flow back and forth like this, it builds a rapport with the subscriber that will keep them around as long you’re putting out new and valuable content. You can also direct your readers to your contact page and title their message “Free (Product/Download/Trial)” and answer the questions in the body of the message. 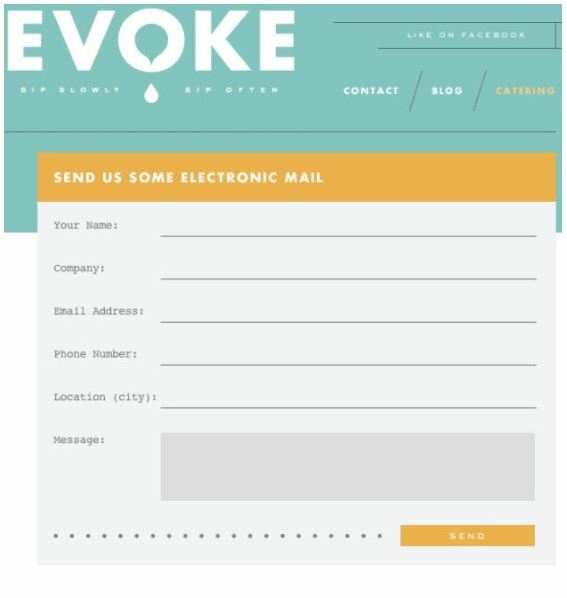 Here is a great example of a contact form that the website Evoke uses. Notice that they used a casual, relaxed letterhead style with light colors. The purpose here is to make the user feel more at ease and comfortable getting their message across. Your emails should have a personal, casual, “Hey, here’s something for free because we are friends” tone. First, delivering exclusive content to your subscriber’s inbox is the perfect reason for them to decide to engage with you in the first place. This goes back to the freebie email as well. People have a greater sense of value if they are getting more than your latest sales pitch. By providing something of value to your readers, you’re increasing your trust with them and improving the odds that they engage with your website. Secondly, creating custom content for your subscribers means you can save the list of content (depending on how many pieces you have) and create an email drip for your customers. Here’s an example drip email from Bonafide. 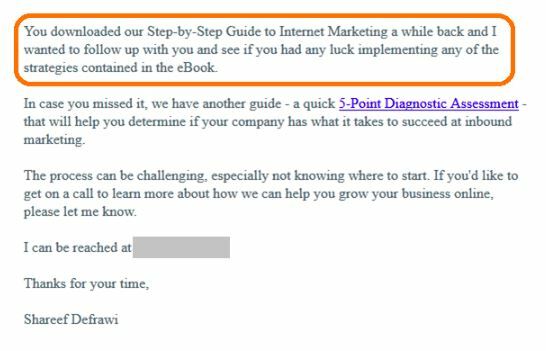 Bonafide started by reaching out and saying that the customer previously received their guide on internet marketing. By acknowledging this factor, they are stirring the memory of their customer and pointing back to their previous drip email. They then go in and say, “In case you missed it,” and link a new article. This is just one example of a transition to a new piece of content. Try to remain friendly and approachable in these, and all, of the emails here. For example, you could also say, “Hey! I thought you might like this…” followed by the piece you want to show your readers. The best way to get readers to stay committed to your brand is by building trust. Nothing says “trust” like someone who wants to help when you’re in need. That same logic can be applied to your readers who sign up for your email list. Try to think about the different ways your blog helps customers. There’s always going to be questions about the topic you’re discussing, regardless of your niche. It’s your job to reflect on, or proactively consider, the questions that may come up in your readers’ minds and address them in the form of a helpful email. As an example, let’s say you’re in the marketing business and trying to figure out how to reach more customers. You visit a website run by a group of personable, helpful people who provide great content. But you still have some questions. They then encourage you to sign up for their email list for more marketing tips. A couple days later you check your inbox and see an email from the trusted website saying, “Oh hey, I just found this awesome tip and I thought you’d enjoy it!” Wouldn’t that establish trust and make you think, “these people understand my struggles.” You’re going to want to bring that same assurance to your customers. Below is another type of helpful email you can send out. The appeal is to encourage subscribers to read an article and post their feedback (read: build engagement) and help them discover the areas of opportunity. 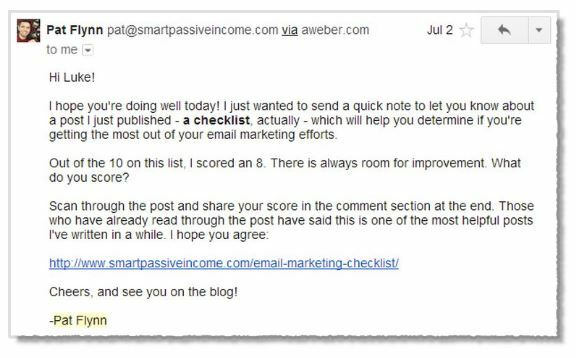 These tips should give you a great idea for what kind of content your subscribers want to see in their inbox. As your blog continues to grow and you forge a connection with your audience you’ll begin to notice trends in their behavior. You can put this to use in order to keep developing killer content to your subscribers and have a successful blog viewed by hundreds of thousands (potentially millions!) of people.